become the next proud owner of this elegant and updated 3 bedroom freehold end unit town home, centrally located with easy access to shopping, schools, parks and transit. 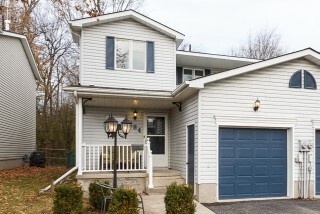 situated on a quiet cu-de-sac, you will enjoy all that nature has to offer sitting on the back deck of your fully fenced yard overlooking mature trees & green space. open concept main level suited for entertaining family & friends, rich dark laminate flooring, freshly painted neutral dcor & ceramic flooring in the powder room and kitchen. spacious kitchen & island, perfect for the avid cook along with built-in dishwasher & brand new counter, sink & faucet. dark wood staircase & skylight leading upstairs provides a bounty of natural light to which the dark laminate follows throughout the 3 generously sized bedrooms. other updates, new laminate flooring basement rec room, new high efficiency furnace 10. a place for all to enjoy including the newer park just steps away for the children/grandkids to play!